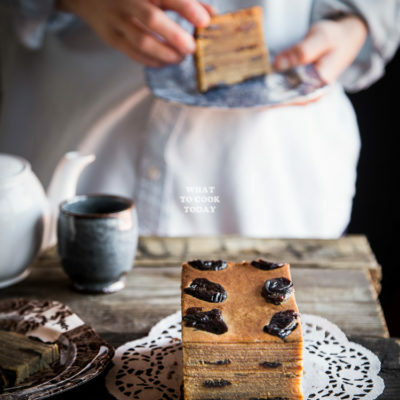 Lapis legit is popular Indonesian cake that is characterized by its 10-20 thin layers of rich, moist, and buttery cakes flavored with spices and studded with flattened prunes. Time-consuming to make but every layer is worth it! Place the butter and sugar in large mixing bowl or stand mixer bowl with paddle attachment. Cream them until they are pale and fluffy. Add the egg yolk one by one (IMPORTANT: do not dump all the egg yolks in or the batter will separate) and let it mix through before adding another egg yolk. Repeat until you add all of the egg yolks. Add in the condensed milk and mix again until it is mixed thoroughly. Add in the milk powder, spekkoek spices and let it mix again. Add in the cake flour and salt mixture gradually until it is mixed thoroughly.